LinkedIn has always been portrayed and thought of as the social network of choice for professionals to mix, find jobs and network with like-minded individuals and companies. This remains the case of course, but additional functionality to groups, company pages and profiles mean that more enterprises have now begun to use the network, rather than just individuals. 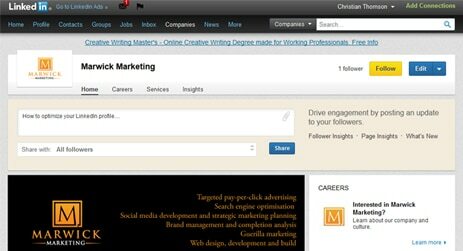 In the past, the full potential of LinkedIn as both a networking and marketing tool hasn’t been fully utilised. However, this is changing as more bosses realise the power of social networking in general, and the options that LinkedIn offers in terms of attracting new customers, staff and cementing a brand. What can I get from a Optimize LinkedIn? A new job, new customers, knowledge. That’s just the tip of the iceberg. The problem has never been that using LinkedIn can’t provide help with all of this, but rather that people don’t use the platform properly. When searching, it’s important to remember that it’s by far a much better idea to get to know people before embarking on hard-sell. Remember that social networks are all about a two-way conversation, which enables you to build trust and get to know a potential client, or colleague. – Don’t spam people – I get a lot of unsolicited email from LinkedIn and the vast majority of it gets ignored. This is because they’re mostly group emails sent to lots of people at the same time. For example, this week I had a writer offer her services who clearly didn’t have any idea what I do for a living. This immediately put me off reading any further, as it would any potential client who is wrongly targeted. – Build relationships – it’s not Facebook so ensure these are professional relationships, so that you can network effectively. This has been made easier by added functionality within search, companies and groups. It’s also a good idea to use the ‘add people you know’ function and build contacts with ‘LinkedIn Signal’ so that you connect with people who have the same interests as you. We’ve mentioned before that it’s worthwhile ensuring that your profile is fully fleshed out, but it bears repeating. The better your profile and the more information you give, the better you will show up in search results and gain useful connections. Make sure too that the Groups you join are relevant to your interests, you update your status daily and that you interact with others. This means commenting on news posted by others in your network, as well as interacting with group discussions and so forth. Get all of this right and before you know it, people will know who you are and what company you’re connected to. Then you can really get stuck in and start (gently!) discussing the products or services that you have on offer to a rapt audience who trust what you have to say.